It’s interesting how many of our show customers will gravitate towards our largest plane, the #8 Jointer Plane. Even those who are not woodworkers, and may just be accompanying a friend or colleague, seem to have the same tendencies. I guess it shouldn’t be too surprising, as this is one massive tool. The #8 plane weighs in at 10 lbs, which sounds like it would be unwieldy to use, but in actuality the mass is very beneficial keeping the tool moving through the cut, and if you’ll remember to hit the sole with a bit of paraffin wax, the effort used drops dramatically. The #8 Jointer is the longest of the metal bench planes and the length of the sole is what makes it such a good choice for flattening wood. I’ll use a sea/boat analogy to describe why this extra length makes a difference. When out on the ocean, there are usually waves to navigate. Let’s say you have a 240 ft boat, and a 60 ft boat. If there happens to be 70 feet between waves, then the 60 ft. boat will just ride up and down the waves, but the 240 ft. boat will span across 2+ waves at a time, so it will just ride on the tops of the waves, and will not follow the large up/down undulations. This is very much like comparing a #8 Jointer and 60 1/2 block plane (actually, since the #8 is 24” and the 60 1/2 is approx 6”, I chose the boat sizes as larger scale sizes of these two planes) working wood that is not yet flat and true. The hills and valleys in the wood can be seen as the waves in water, even though they are obviously much smaller. The concept, though, is similar. If you are trying to make a rough piece of wood flat, then you need something long enough to span across the tops of the “hills”, and not just continue to follow the existing contours, like planes with shorter soles. Beyond the flattening role of this plane, it can handle other work as well. Another job in which this massive plane excels, is when it is used to “shoot” edges using a shooting board. For those not familiar, there are plans showing how to make a shooting board available for download at the Lie-Nielsen website. Shooting can work on end grain to sneak up on the exact dimension (a thousandth of an inch or so at a time), can work on long grain, or with fence modifications, can shoot angles (miters) other than 90 degrees on the ends of boards. 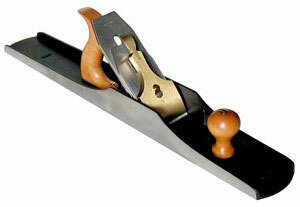 The Jointer plane is set up similarly to most of the other bench planes. The blade should be razor sharp (which is the same on all cutting tools), and many will want to apply a small camber (curvature across the width of the iron). This small cambering prevents the all-dreaded plane tracks, which are left when the corner(s) of the iron cut deeper into the wood than the surface adjoining it. The shaving thickness should be in the 4 – 5 thousands of an inch range, and so the camber should be sufficient that neither of the corners will make contact with this thickness of shaving. Similarly, the opening between the cutting edge and the front of the mouth shouldn’t be too wide, but just enough for this thickness of a shaving to pass without clogging. Another thing I always try to remind people, is how this plane can always sub in for a fine smoother (just remember that statement doesn’t go both ways, as the shorter smoother can’t adjust its length). The only thing I’ll adjust in the setup, if I’m intending to perform smoothing functions, is the depth of cut. I’ll back the iron out and then advance it until I have a 1 – 2 thousands of an inch shaving. Since the throat opening is usually still in the 6 – 7 thousands of an inch range, this will give decent support for all but the most figured woods. If the wood does happen to be too difficult to prevent tear out, then I’ll just switch over to one of my dedicated smoother with their super tight throat settings. Most of the time though, the jointer can do an adequate job, and depending on how large the area being worked is, it may just save the extra couple of steps over to your toolbox. I hope to see some of you at our events across the country. Feel free to come up and say hello and make sure you try out our #8 Jointer. Lee Laird has enjoyed woodworking for over 20 years. He is retired from the U.S.P.S. and works for Lie-Nielsen Toolworks as a show staff member, demonstrating tools and training customers. Take a look at our full selection of Lie-Nielsen Hand Tools. The Plane Facts: Lie Nielsen #101 Violin Maker’s Plane – Just don’t let the name fool you! About a day ago from Highland Woodworking's Twitter via Hootsuite Inc.